Registration at Holiday Inn Express Hotel. Participants will receive a welcome bag with necessary materials. Check in to the hotel will be possible from 15:00. Participants will walk to the Cervantes Institute, our conference site (13 minutes walk, directions will be provided). Elective groups meet for the first time. Introduction to the Centropa website and the resources we offer. Time to discuss the scavenger hunt pre-trip assignment. Screening the Centropa film of Rosa Rosenstein, a Berlin-born Jewish woman who lived through the turbulent times of Imperial Germany, the Weimar Republic and the Third Reich. Two teachers present inspiring lessons demonstrating the uses of Centropa resources. We will walk together to Cervantes Institute, to drop off laptops for later work sessions. On the first day, each participant will receive a welcome bag including the German Jewish Sourcebook. The German Jewish Source Book is the first in a series of Centropa readers on Jewish communities of Central and Eastern Europe. With essays, timelines and general histories on twentieth century German history, this volume also offers the stories of four German Jews who describe growing up in Weimar Germany and who fled their country just in time. This volume also offers essays that delve into the complex relationship between Germans and Jews, testimonies of Czech, Hungarian and Romanian Jews who were liberated from concentration camps in Germany, as well as personal stories of Russian and American Jewish soldiers who liberated those camps. Walk to the hotel. Time to change for Shabbat. Shabbat service at Pestalozzi Str. Synagogue, the last classic German liberal service with the liturgy composed by Cantor Lewandowski. Rabbi Jonah Sievers will welcome our group. Free morning. Lunch on your own. At the Anhalter Bahnhof, a former train station and site of one of the first Kindertransports in 1938, which were established after the infamous Reichspogromnacht in November 1938, we will read aloud from the personal memories of Centropa interviewees. Be sure to bring your German Jewish Sourcebook. Berlin’s Holocaust Memorial is dedicated to the Jewish victims of the Nazi genocide of World War II. Participants have 15 minutes to explore the monument on their own. The underground Ort der Information (Information Centre) complements the abstraction of the memorial with personal documentation about individuals and families. This includes biographical details, recordings and information about memorial sites throughout Germany and Europe. Documenting the universal issue of genocide, the centre represents a central focus on the diverse memorial sites across Germany which stress the living memory aspect of remembrance. Participants explore the exhibition on their own. The vast Stalinist memorial park was built for the 55,000 Soviet soldiers that fell taking Berlin in 1945. The park also serves as a cemetery of 7000 soldiers. 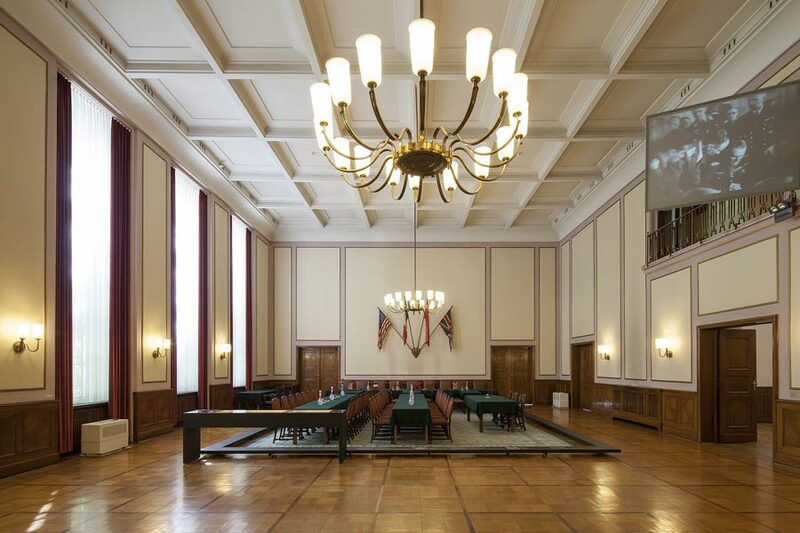 Later we visit the building where on 8 May 1945, the High Command of the German Wehrmacht signed a document of unconditional surrender in front of representatives of the four Allied powers in the main hall of the officers’mess of a Wehrmacht military engineering training facility. From 1945 to 1949 the building was the headquarters of the Soviet Military Administration in Germany. In 1994, with the final withdrawal of the Russian troops the Museum Berlin-Karlshorst Association was established, and on 10 May 1995, for the 50th anniversary of the end of the war in Europe, the German Russian Museum Berlin-Karlshorst opened. In 2013 a newly conceived permanent exhibition was presented to the public. Short guided tour in four groups. Followed by 30 minutes on your own to explore the site. The Berlin Wall Memorial is the central memorial site of German division, located in the middle of the capital. Situated at the historic site on Bernauer Strasse, it extends along 1.4 kilometers of the former border strip. The memorial contains the last piece of Berlin Wall with the preserved grounds behind it and is thus able to convey an impression of how the border fortifications developed until the end of the 1980s. The events that took place here together with the preserved historical remnants and traces of border obstacles on display help to make the history of Germany’s division comprehensible to visitors. Participants take part in the tour based on their preferences indicated in the registration form. Centropa staff will provide directions and day passes for public transport. The Jewish Museum Berlin opened in 2001 and is the largest Jewish museum in Europe. It consists of three buildings, two of which are new additions specifically built for the museum by architect Daniel Libeskind. German-Jewish history is documented in the collections, the library and the archive, and is reflected in the museum’s program of events. Please note that the permanent exhibition of the museum is currently under construction, so that the two upper levels of the Libeskind Building will not be accessible for us to visit. In 1993, Berlin-based artists Renata Stih and Frieder Schnock inaugurated their “Places of Remembrance” memorial. Today you can see the 80 signs that are hung on lamp posts throughout the Bavarian Quarter, each one spelling out one of the hundreds of Nazi laws and rules that dehumanized Berlin’s Jewish population. Here, you can see Albert Einstein and Hannah Arendt’s houses alongside all the signage commemorating the laws that limited Jewish daily life. Check out this 2013 interview by the New York Review of Books with the artists! 7xjung offers intense workshops for dealing with the past times of National Socialism, as well as with the present-day issues of identity, exclusion and civil courage. They advocate that everyone can be an agent of change by expressing and discussing new perspectives on history, the present, the individual and personal possibilities of shaping society in a wholly democratic way. This cemetery is where some of the greatest names in Weimar culture are buried: Bertolt Brecht, Heinrich Mann and Hanns Eisler. Next door to the entrance of the cemetery at 125 Chaussee Straße is where Bertolt Brecht and Helene Weigel spent their final years after returning to Berlin from America. Only Eisler was Jewish, but all three fled Nazi Germany for Los Angeles. Hounded for being Communists, Eisler and Brecht left America (Eisler was deported, Brecht left on his own accord) for the newly created GDR. Also within the cemetery are several monuments including a tall cross dedicated to the resistance fighters who perished under the Nazi regime with the names of the men involved in the 20 July 1944 plot to assassinate Adolf Hitler as they were executed in a nearby park. Next to the cross there is a marker indicating a mass grave of 64, mainly unknown, persons who were killed in the cemetery days before the end of the war. Finally, there are a number of ehrengrab, or graves of honor, including Johannes Rau, the eighth president of West Germany and first German head of state to address the Knesset in Israel. Note that the cemetery is adjacent to the French cemetery, sometimes referred to as the cemetery of the Huguenots. You will meet in small groups, with one or two people from each of the morning’s field trips, describe what you did and what you saw and what you will bring back to your students from this morning’s experience. Explain what you saw, but we’re also hoping you take a big picture approach to discuss how what you saw might be used in the classroom – this might be the information you learned, or it might be a similar type of field trip. Veteran teachers from Europe, US and Israel will present different projects they did with their students based on Centropa materials. 15 minutes per presentation. Participants get to choose which project their want to learn more about. Ed Serotta will introduce Centropa´s newest film, the story of Menachem Mayer who grew up in the South German village of Hoffenheim in Baden Württemberg, and who now lives in Israel. The film is narrated by Ilay Elmkies, an Israeli teenager who plays for the TSG Hoffenheim youth soccer team. Michael Heitz and Alan Götz, two teachers from Germany, will present teaching materials for the film. Followed by Q&A session with Michael Heitz, Alan Götz and Ilay Elmkies (Skype), the narrator of the film. The Tränenpalast – “The Palace of Tears” – was constructed in 1962 at Friedrichstraße train station in Berlin, and served the GDR dictatorship until 1990 as a departure terminal for people leaving the GDR for West Berlin. Like no other location, the pavilion serves as a reminder of the partition of Germany and of all the fates connected with it. We begin with an introduction (by Ed Serotta) to Jewish Salonika, the port city known to Greeks as Thessaloniki. When the 20th century began, 93,000 Jews lived here, and nearly all of them could trace their family roots to 15th century Spain. The Jewish community was the largest ethnic minority in the city; it wasn’t even possible to unload a ship on the Jewish Sabbath. By the time the German Wehrmacht withdrew from Salonika in the fall of 1944, there were no Jews left alive in the city – around 1,000 Jews were there after the war. Ed Serotta will introduce Centropa’s Greek film “A bookstore in six chapters” about the Renee and Solon Molho. Narrated by their daughter, Nina Molho, in English, Greek, French and Ladino, this powerful film takes us through the bustling streets and alleyways of pre-war Salonika. We then travel with Solon and Renee as a Spanish diplomat, a family of Greek farmers, and an Athens housewife save their lives during the Second World War. Afterwards, the newlyweds re-established the Molho bookstore, which remained the epicenter for Salonika’s literary scene—until it closed its doors in 2004. Evgenia Doulami, a teacher from Greece, will present how she used the Centropa film about Renée Molho with her students. Daniela Sterjova and Damjan Snoj will present the Centropa website “Lost Sephardic World of The Western Balkans”, which accompanies the travelling exhibition available for schools in former Yugoslavia. During the siege of Sarajevo from 1992-1995, the Jewish community of Sarajevo became a beacon of hope for all those who were looking for help, regardless of their ethnicity. A tiny group of Holocaust survivors and their offspring took the words never again and put them to work. They set up La Benevolencija (“good will” in Ladino), their own humanitarian aid agency. Who worked there? Jews and Muslims, Serbian Orthodox and Catholic Croats. We will screen “Survival in Sarajevo,” our most popular film in schools worldwide. Followed by presentations and a discussion of how this film and the accompanying Sarajevo exhibition can be used in inter-cultural education. Watching the films of the video elective.